In human anatomy, the ureters are tubes made of smooth muscle fibers that propel urine from the kidneys to the urinary bladder. 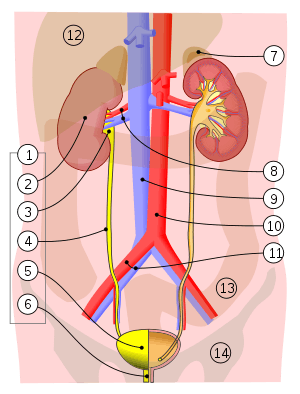 In the adult, the ureters are usually 25–30 cm (10–12 in) long and ~3–4 mm in diameter. Histologically, the ureter contains transitional epithelium and an additional smooth muscle layer in the more distal one-third to assist with peristalsis. In humans, the ureters arise from the pelvis of each kidney, and descend on top of the psoas major muscle to reach the brim of the pelvis. Here, they cross in front of the common iliac arteries. They then pass down along the sides of the pelvis, and finally curve forwards and enter the bladder from its left and right sides at the back of the bladder. :324–326 This is classically depicted as running "posteroinferiorly on the lateral walls of the pelvis and then curve anteromedially to enter the bladder". The orifices of the ureters are placed at the postero-lateral angles of the trigone of the bladder, and are usually slit-like in form. In the contracted bladder they are about 2.5 cm. apart and about the same distance from the internal urethral orifice; in the distended bladder these measurements may be increased to about 5 cm. The junction between the pelvis of the kidney and the ureters is known as the ureteropelvic junction or ureteral pelvic junction, and the junction between the ureter and the bladder is known as the ureterovesical (ureter-bladder) junction. At the entrance to the bladder, the ureters are surrounded by valves known as ureterovesical valves, which prevent vesicoureteral reflux (backflow of urine). During the embryologic development of the kidney, the ureteropelvic junction is the last part of the ureter to become patent. Within the periureteral adventitia these arteries extensively anastomose thus permitting surgical mobilization of the ureter without compromising the vascular supply as long as the adventitia is not stripped. Lymphatic and venous drainage mostly parallels that of the arterial supply. The ureters are a component of the urinary system. 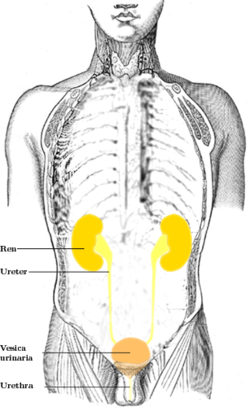 Urine, produced by the kidneys, travels along the ureters to the bladder. Doppler ultrasound image ureteric jet effect inside urinary bladder. Cancer of the ureters is known as ureteral cancer. The ureters are also known for being extremely hard to work around during surgery and account for 80 percent of failed kidney transplants. Failure of the ureteropelvic junction to become patent during development is the most frequent cause of bilateral hydronephrosis, particularly in male neonates. Pyeloplasty, which involves excision of the stenotic section and creation of a new junction, is the most common and effective treatment for this problem. Injuries to the ureter with certain forms of trauma including penetrating abdominal injuries and injuries at high speeds followed by an abrupt stop (e.g., a high speed car accident). The ureter is injured in 0.2 per 1,000 cases of vaginal hysterectomies and 1.3 per 1,000 cases of abdominal hysterectomies, near the infundibulopelvic (suspensory) ligament or where the ureter courses posterior to the uterine vessels. where the ureter enters into the urinary bladder (vesicoureteric junction). Vesicoureteral reflux refers to the reflux of fluid from the bladder to the ureters during urination. This condition can be one cause of chronic urinary tract infections, particularly in children. Vesicoureteral reflux may be treated surgically, and is believed to have a genetic basis. Ureters are also found in all other amniote species, although different ducts fulfill the same role in amphibians and fish. 1 2 3 4 Drake, Richard L.; Vogl, Wayne; Tibbitts, Adam W.M. Mitchell; illustrations by Richard; Richardson, Paul (2005). Gray's anatomy for students. Philadelphia: Elsevier/Churchill Livingstone. ISBN 978-0-8089-2306-0. ↑ Gai, Dayu. "Dr". Radiopaedia. Dr Dayu Gai. Retrieved 12 June 2016. ↑ Dudeck, Ronald W. (2007). High-yield kidney. High-yield systems (1 ed.). Lippincott Willams and Wilkins. p. 19. ISBN 978-0-7817-5569-6. ↑ Lowe, Alan Stevens, James S. (2005). Human histology (3rd ed.). Philadelphia, Toronto: Elsevier Mosby. ISBN 0-3230-3663-5. ↑ Stein DM, Santucci RA (July 2015). "An update on urotrauma". Current opinion in urology. 25 (4): 323–30. doi:10.1097/MOU.0000000000000184. PMID 26049876. ↑ Burks FN, Santucci RA (June 2014). "Management of iatrogenic ureteral injury". Ther Adv Urol. 6 (3): 115–24. doi:10.1177/1756287214526767. PMC 4003841 . PMID 24883109. ↑ Santucci, Richard A. "Ureteral Trauma". Medscape. Retrieved 11 April 2012. ↑ "Symptoms of Kidney Stones". MedicalBug. 1 January 2012. Retrieved 11 April 2012. ↑ Resnick, Martin I; Lam, Mildred; Zipp, Thomas (4 September 2009). "Kidney Stones". NetWellness. Retrieved 11 April 2012. Anatomy photo:40:06-0111 at the SUNY Downstate Medical Center — "Posterior Abdominal Wall: Internal Structure of a Kidney"
Anatomy figure: 43:08-02 at Human Anatomy Online, SUNY Downstate Medical Center — "Relationship of the ureter to the uterine artery." Anatomy figure: 44:02-01 at Human Anatomy Online, SUNY Downstate Medical Center — "Mid-sagittal section of male pelvis." Anatomy photo: Urinary/mammal/ureter/ureter1 - Comparative Organology at University of California, Davis — "Mammal, ureter (LM, Medium)"
Histology at KUMC urinary-renal15 — "Ureter"